Boulder, CO – The fun part of weather prediction is the uncertainty. Sure, it drives me mad, but it’s also fascinating to watch the atmosphere play out its magic in front of my eyes. It’s even more fascinating when atmospheric magic culminates in almost a foot and a half of powder.nThe most recent storm to move across Colorado sure was a puzzler. From the computer models, it looked like many mountains would receive 4-8 inches of snow, especially along and north of I-70 and Summit County. That was my prediction about 12 hours before the storm started, and even as the storm cranked up around midnight Monday evening, I still felt pretty good about my prediction. Fast forward five hours, and the 5 a.m. Tuesday snow reports told a different story. While a few mountains to the north and south of I-70 hit the 4-8 inch forecast, many areas along I-70 – like Vail, Copper, Breckenridge, and Loveland – had over 8 inches of snow and it was still coming down hard. This graphic shows the eventual storm totals, and you can see a bulls eye right along I-70. Why did this much snow fall? It’s a good question, and one that I tried to answer as I looked at the weather maps the next day. The only way to get better at the snow prediction game is to constantly learn from past mistakes, so it was my mission to figure out the atmospheric magic. Unfortunately, it’s not a very simple task to figure out what happened (yes, past tense) with the weather. For instance, why did Steamboat get 50% of the snow compared to Vail, even though both areas had good moisture and a favorable wind direction throughout the storm? The best answer that I can come up with is that the actual center of the storm – and therefore the most energy to wring snow out of the air – tracked directly over I-70 from the northwest, just as the arrow above shows. 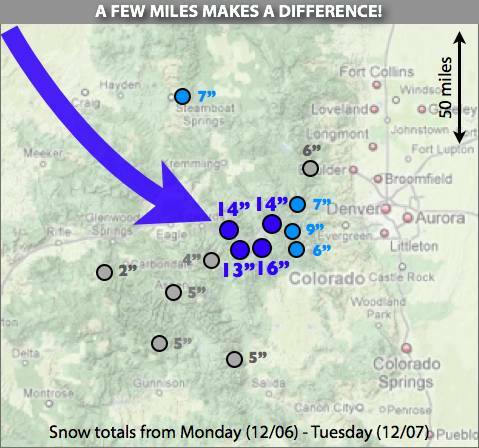 It really was a game of inches, or miles, since it was possible that the center of the storm could have tracked 50 miles north and dumped on Steamboat while leaving I-70 with 50% of the snow compared to its southern neighbors. Even as the storm was in progress, it was still hard to predict that there would be a bulls eye of snow exactly over I-70 and Summit County. While I can somewhat recreate the event and learn from it, the next storm may be just challenging to predict. But then again, that’s the fun of it.